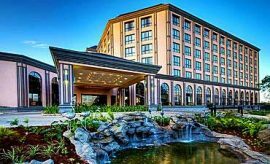 Overlooking the city's landmarked Central and Uhuru Park is Nairobi Serena Hotel, an excellent choice of accommodation for your leisure or business travel visit to Nairobi (read more on the best time to go). 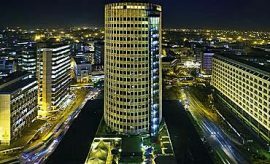 Located just 12 miles from the Jomo Kenyatta International Airport, the hotel is conveniently located near the city's key urban attractions, shopping and restaurants. Most of the 184 guest rooms are Standard Deluxe, but the hotel also offers upgraded options to AfricanMecca guests who would like to take on the limited Superior Rooms and a selection of suites, including Business, Executive, Garden, Bateleur and State. In-room amenities include air conditioning, telephone, internet services, mini bar, digital safe, tea/coffee maker, 24-hour room service and laundry. The Standard Deluxe Rooms have incredible views of the park or cathedral and feature one queen-size bed or twin beds, walk-in shower and separate bathtub. Superior Rooms have king-size beds and private verandas. 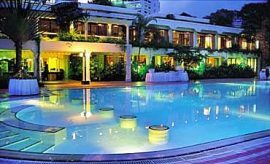 To help with all of your urban vacation needs in Kenya, the hotel offers several guest services and facilities which include personalized concierge, travel desk, taxi and limousine services, valet and shoeshine, as well as the Maisha Spa, Health Club, heated swimming pool, Bambara Resident's Lounge, gift shop and a hair and beauty salon. The five Business Suites feature a separate bedroom with king-size bed, sitting room with separate work area, dining area with four-person table, private veranda and guest bathroom. The six Executive Suites are designed with an open floor plan and include bedroom with king-size bed, large sitting area with sofas, separate work area and private veranda. A wondrous garden setting is an unexpected metropolitan travel experience in East Africa, and this is exactly what you will find in one of the three Nairobi Serena Hotel Garden Suites. These suites feature an open floor plan, king-size bed, sitting area, private garden patio, outdoor arbor and lounging area with seating for four people and direct access to the hotel estate. The spacious Bateleur Suite is elegantly designed and features a king-size bed and separate sitting area, and the State Suite is the largest suite available at the hotel, with large master bedroom, spa-like bathroom, separate dressing area, sitting room with plasma television and audio equipment, work area, private dining area and kitchen, bar, entryway and guest bathroom. Your safari excursions in Kenya with AfricanMecca are sure to whet your appetite for flavorful and satisfying meals, and the Nairobi Serena Hotel offers a variety of dining choices. The selections include both causal and formal settings that are either indoor or outdoor. The Mandhari Restaurant is an icon in Nairobi, recognized for varied a-la-carte dining options from French to Mediterranean. The Cafe Maghreb offers buffet-style breakfast and lunch with international influences while the French pastries, gateaux, muffins and spiced delights at The Patisserie should not be missed! In the evenings, you can also indulge in a delicious cocktail, glass of wine or refreshing beer from the Aksum Bar while mingling with other guests, or from the Pool Terrace Bar while safari scanning the African night sky with its striking display of twinkling stars. When staying at Nairobi Serena Hotel in Kenya, we recommend experiencing some of the surrounding Nairobi attractions and cultural activities before heading out on your Kenya safari to Amboseli, Masai Mara and Laikipia - Lewa ending with a beach vacation and Swahili cultural tour in the exotic spice island of Zanzibar, or even Mombasa.